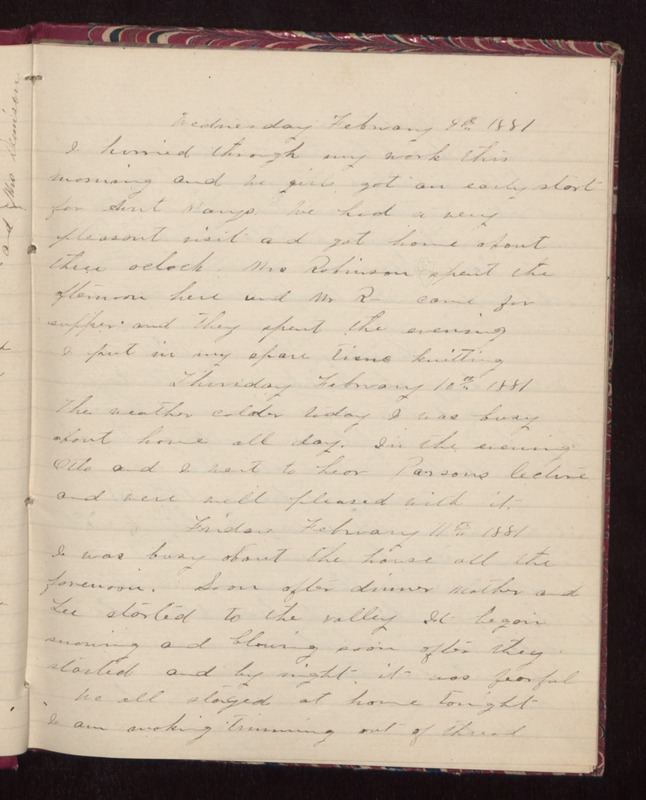 Wednesday February 9th 1881 I hurried through my work this morning and we girls got an early start for Aunt Marys. We had a very pleasant visit and got home about three oclock. Mrs Robinson spent the afternoon here and Mr R- came for supper and they spent the evening. I put in my spare time knitting. Thursday February 10th 1881 The weather colder today. I was busy about home all day. In the evening Otto and I went to hear Parsons lecture and were well pleased with it. Friday February 11th 1881 I was busy about the house all the forenoon. Soon after dinner Mother and Lee started to the valley. It began snowing and blowing soon after they started and by night it was fearful. We all stayed at home tonight. I am making trimming out of thread.